Enter in your mobile phone number or e-mail address and we will notify you when Garmin CityNav USA Mexico Maps MicroSD is back in stock. City Navigator North America & Mexico provides detailed road maps and points of interest for your Garmin device, so you can navigate turn by turn to the destination of your choice. This map is provided on microSD card (with SD sleve) so just plug it into your compatible Garmin GPS and you're ready to navigate North America & Mexico! 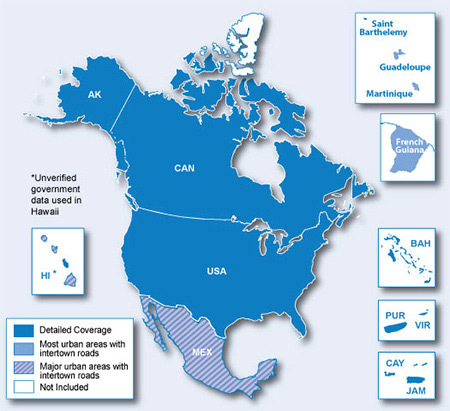 Coverage includes detailed maps for all of the United States, Canada and Mexico, including Alaska, Hawaii and Puerto Rico. City Navigator brings you the most detailed street maps available so you can navigate with exact, turn-by-turn directions to any address. You can also route to over 6 million Points Of Interest such as restaurants, gas stations, lodging, attractions and more. Also includes detailed information such as turn restrictions, speed categories, roundabout guidance and other navigation features. 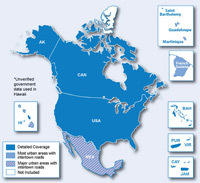 Detailed maps for the U.S., Canada and Mexico, including Puerto Rico, U.S. Virgin Islands, Cayman Islands and the Bahamas. Just back from a trip to the US and great out on the open road especially for speed reminders. I used this on a Montana which is not really a road NAV GPS unit but worked very well all round. Easy to install, and worked well. I bought this for my Garmin unit for my recent north America holiday. I used it whilst driving around the USA and it worked well. It was as simple as plugging the SD card into my Garmin GPS and away it went. My main criticism though is that I could not use the voice recognition with the US maps, and also it lead me astray on a couple of occasions down dead end dirt roads. Aside from that it certainly helped navigate in the US. Generally good but could be a bit out of date in some areas. Has led us into some real traps with our large RV. Some of this could be due to GPS error but these roads were dead ends and difficult to turn around. We often find that strees shown on Google are not even recognisd by the map provided - this happnes all the time. As above. It's very frustrating when we try to find exact addresses in small to mid sized towns on British Columbia where we are travelling and we have to resort to Google. Whole areas of streets are missing on the maps and are not listed in the Go To search. It would be a great product except for tat with plenty of warning and imagery. Pros: The general way it operates is good with plenty of warnings and good imagary on 3D. Cons: Many streets and roads not listed compared with Google.